Butterfly migration is even more amazing than bird migration. Bird migration includes the same generation, but butterflies that begin migrating north never live long enough to return south. Instead, butterflies gradually expand their range north as the weather warms; breeding, laying eggs, and dying. The next generation advances farther north. Then, several generations later, they begin moving south, retreating before killing frosts. The gulf fritillary (Augraulis valinae) is an example of a migratory butterfly. They winter in Florida, south Texas, and Mexico, but generations of them migrate as far north as Pennsylvania. Gulf fritillaries were named because they are some times seen fluttering over the Gulf of Mexico. Their larva feed upon passion flower vine (Passiflora incarnata) foliage. 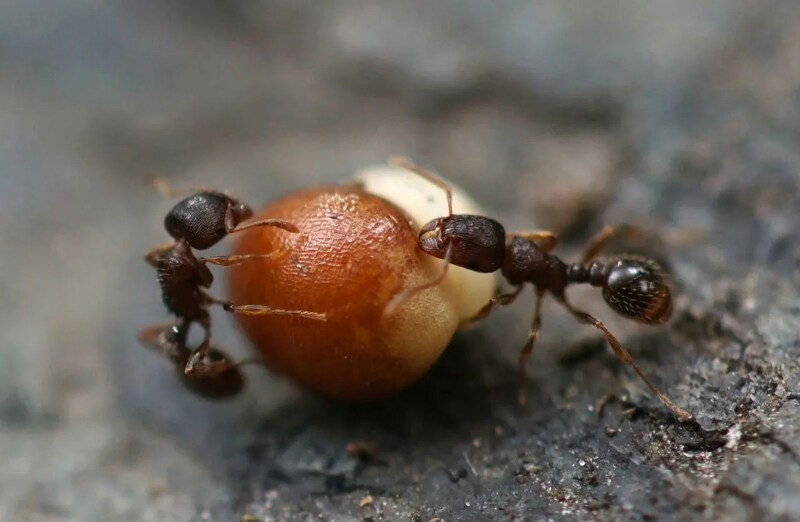 The adults obtain their energy from nectar in flowers , and as the below photo represents, they often find some nutrition in animal feces. Gulf fritillaries are particularly fond of lantana, a non-native shrub that rapidly colonized Florida during early Spanish occupation. Gulf fritillary snacking on dog feces. Passion flower. Spanish conquistadors thought it symbolized the passion of Christ. The fruit of passion flower is edible. The seeds are covered in a gelatinous substance with a sweet-sour flavor and a tropical aroma. Brazil produces and consumes the most passion fruit. 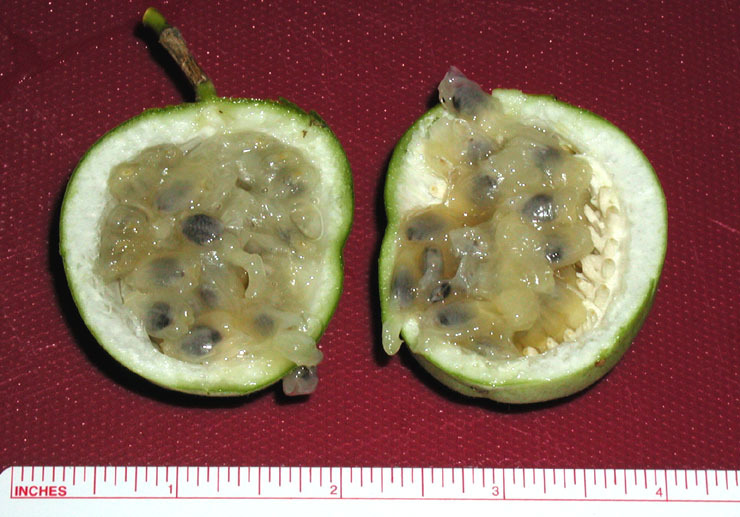 Imported passion fruit is occasionally available in the grocery store. There are between 520-700 species of passion flower vine–taxonomists disagree about the number of species. 96% of them occur in the Americas, indicating this is where they originated. Other species live in southeast Asia, Australia, and Pacific islands. They probably colonized these regions by rafting on clumps of debris ripped from the land by tropical storms. P. incarnata and the crinkled passion flower (P. gracilis) are the only species that evolved to live in temperate climates. P. gracilis is restricted to 1 county in South Carolina, while P. incarnata ranges throughout eastern North America. During the Miocene when most of North America was sub-tropical there were probably many species of passion flower native to North America, but just 2 evolved the ability to survive frosty seasons. Passion flower vines are shade intolerant but drought tolerant. They prefer disturbed areas, and I’ve found them growing on vacant lots in my neighborhood. This species was well adapted to live during the Pleistocene when rapid climate change and megafauna foraging often drastically altered local landscapes. Mammoths and other large animals girdled and uprooted trees, opening up the canopy so shade intolerant passion flower vines could thrive. Many vertebrates, perhaps peccaries, fed on the fruit and distributed the still viable seeds in their dung. Long Ice Age droughts also killed trees and let passion flower vine spread in the available sunshine, climbing over grass and tree saplings and across bare sandy soils. When the Spanish conquistadors conquered the Americas, they found passion flower vine growing everywhere. The soldiers were super religious, though they ignored 1 of the 10 commandments when they were butchering the Indians. They thought passion flowers symbolized the crucifixion of Christ, known as the passion by religious zealots. Supposedly, the 5 petals and 5 sepals represent the 10 apostles. The 72 filaments = the number of thorns in Jesus’s crown. The 3 stigmas = the cross. The 3 stamens = the wounds in Jesus’s hands. 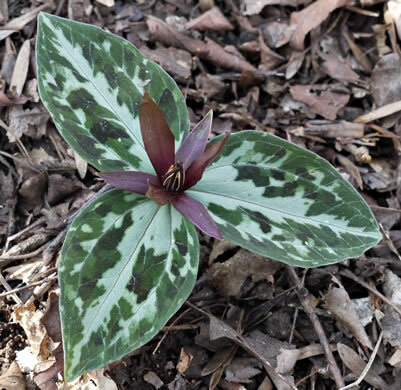 The leaf lobes resemble the spear wounds. The dark spots under the leaves represent the 33 pieces of silver given to Judas to betray Jesus. The flowers die after just 1 day, just like Jesus died after a day on the cross. And the petals reclose like the tomb enclosed Jesus. Some superstitious priest sure had an overactive imagination. Did Large Carnivores Influence Dune Formation in Ice Age Georgia? Over 100 years ago Australians built a 3480 mile long fence to keep dingoes away from livestock. For ecologists this provides a grand experiment of how the exclusion of a large predator influences ecosystems. However, there exists a considerable amount of conflicting scientific literature about this. Many studies report overgrazed regions on the dingo-less side of the fence that have poor soils as a result. The fence bisects a national park. One study confined to part of this park counted 85 dingoes and 8 kangaroos on the side of the fence with the dingoes, and 1 dingo and 3200 kangaroos in a comparably sized lot on the side that is supposed to be without dingoes. Tame livestock, feral goats and hogs, and rabbits along with the kangaroos contribute to these overgrazed landscapes. Parma wallabies, the greater bilby, and small rodents thrive on the side of the fence with the dingoes because the large canines suppress populations of smaller predators. Another study that claims to be more comprehensive than any other found no differences between either side of the fence. The authors of this study suggest there are no differences because dingoes have never been completely eliminated on the supposedly dingo-less side of the fence. They say other studies concluding there is a difference are local and anecdotal. Dingo on a sand dune. 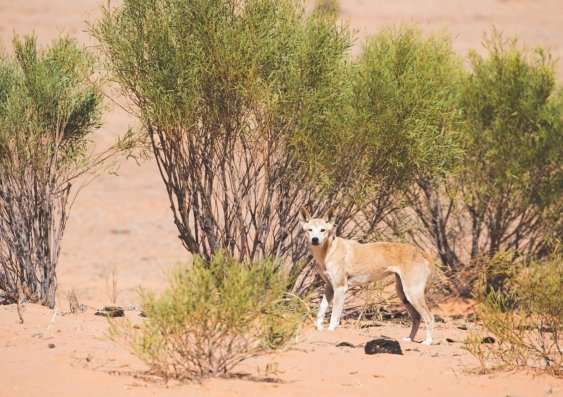 I think the most interesting study is a recent paper that found the presence of dingoes influenced sand dune formation in arid regions. On the dingo-less side of the fence sand dunes were larger and stabilized with shrubby plants growing on top. On the side of the fence with dingoes sand dunes were more shallow, bald, and dispersed by wind because plant growth was sparse. This seems counterintuitive. But this difference in dune formation is caused by the suppression of small carnivore populations. Dingoes reduce populations of foxes and feral cats (neither of which are native to Australia). In turn dusky hopping mice and rabbit populations increase, and they eat the seeds of plants and shrub saplings that keep dunes stabilized. This last study is most interesting to me because sand dunes rolled across parts of Georgia during the coldest driest stages of Ice Ages, and I wonder if large predators influenced their shape and pattern. The arid climate caused some small rivers in Georgia to run dry. Wind blew the riverine sand into big dunes that are still evident today, though scrubby vegetation has since stabilized them. (See: https://markgelbart.wordpress.com/2012/04/09/the-ohoopee-sand-dunes/ ) I’ve hypothesized overgrazing by megafauna alongside shrinking water holes located in the river bed may have contributed to the erosion leading to sand dune formation. But maybe the presence of large carnivores played a role as well. Dire wolves, jaguars, and cougars suppressed populations of bobcats and foxes; causing an increase in rodent and rabbit numbers. The small herbivores stripped the vegetation bare, allowing sand dunes to roll. On the other hand hawks, owls, and snakes probably always remained abundant, and they likely provided a check on rodent and rabbit populations. Nevertheless, the notion large carnivores may have influenced dune formation in Georgia is an intriguing idea. A major marine extinction event rubbed out at least 36% of the ocean’s vertebrate genera about 2.5 million years ago. Scientists believe the extinctions were caused by a sea level fluctuation, resulting from glacial expansion. Ice Ages increased in intensity during the late Pliocene and as more atmospheric moisture became locked in glaciers, sea level fell. Habitat for many coastal species simply disappeared because their near shore environments rose above sea level. A new study determined 55% of marine mammals, 43% of sea turtles, 35% of sea birds, and 9% of sharks and rays went extinct. I believe this estimate may undercount the actual loss because there are likely some extinct species yet to be discovered by paleontologists. Many species of invertebrates became extinct as well. Most of the genera lost were impressive and interesting. Metaxytherium were a widespread genera of dugongs that grazed sea grass off coasts all across the world. Thalassocrus were a group of aquatic sloths that evolved from giant ground sloths. Giant predatory sperm whales (Livyatan) preyed on whales. Psephopherus, giant sea turtles, laid their eggs on beaches. The islands off the coast of South Africa, where several species of extinct penguins nested, became connected to land when sea level fell, and predators were able to invade and destroy their colonies. And of course the famous giant white shark, Megalodon, hunted the many species of now extinct whales that lived during the Pliocene. Most species of baleen whales were smaller and more agile then because they had to avoid these large predators. Metaxytherium floridanum swam near and over what today is Florida. Thalassocrus, an aquatic genera of sloths. 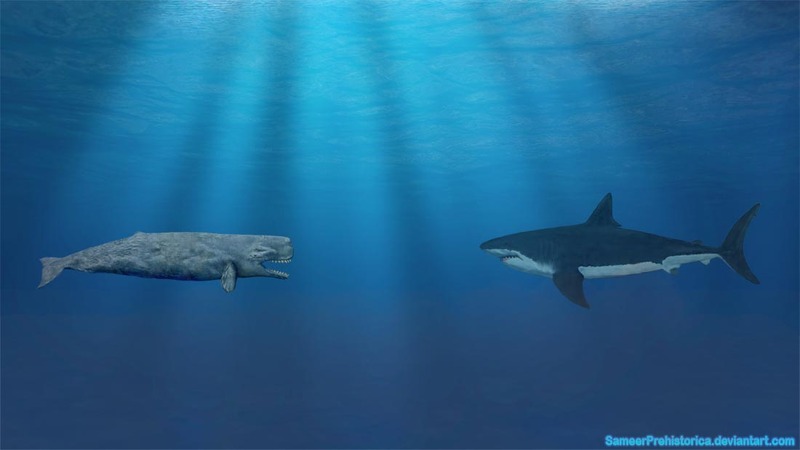 2 of the largest predators that lived during the Pliocene–Livyatan melvillei and Carcharocles megalodon. Both grew to 60 feet long. Baleen whales were smaller and more agile then, enabling them to escape predation. The extinction of these predators allowed baleen whales to evolve to a greater size, so they can gorge on food, then fast when they migrate to warmer calving grounds where killer whales, their only modern marine predator, are uncommon. During the Pleistocene new marine species evolved that were better adapted to the fluctuating sea levels of alternating glacials and interglacials. New genera increased by 21%. However, this means there is still a deficit of -15% fewer marine vertebrates than there were during the Pliocene. Sea life may reclaim the land though, if sea levels keep rising. An octopus recently found its way into a Miami parking garage. If sea levels keep rising, marine life may reclaim territory it lost during Ice Ages. Cloud forests are lush environments unique to high elevations located within tropical latitudes. Vines cover evergreen trees and ferns carpet the ground. Cloud forests occur along the Andes Mountains from Central America to Argentina at elevations between 3600-10,800 feet, and most are frost free due to the tropical latitude, though they are cooler than lowland forests. The low seasonality of cloud forests allows for a diverse assemblage of flora and fauna. Some common plant species found growing in South American cloud forests are elephant ear, strangler fig, and walking palm. Over 400 species of birds reside in cloud forests including an astonishing 30 species of hummingbirds. Mammals such as tapir, peccary, brocket deer, jaguar, cougar, ocelot, and spectacled bear roam cloud forests. Even more species of reptiles and amphibians abound in the thick vegetation of the understory. Huge beetles and a butterfly with see-through wings are just some of the countless insects that thrive in cloud forests. Location of cloud forests around the world. A cloud forest in Ecuador. Invisible wings make this butterfly hard for predatory birds to see. A site with evidence of a Pleistocene-aged cloud forest was unearthed during the construction of an highway in Ecuador. Scientists examined pollen, geochemistry, and charcoal excavated from strata here dated to between 45,000 years BP-42,000 years BP. During those 3000 years the site went through 3 successional stages. Pollen evidence suggests during the initial stage that it was a valley floor swamp dominated by grass, aster flowers, and plants in the nightshade family. 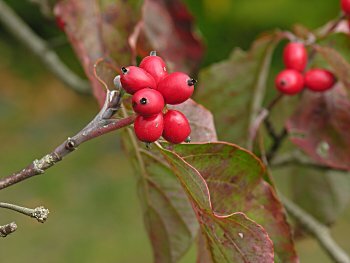 This environment was replaced by a forest of holly and plants in the Melstomataceeae and Weinmannia families. Melastomataceae is a family of tropical flowering plants, and the Weinmannia family includes 65 tropical plants. This stage succeeded to an environment dominated by alder, myrtle, and plants in the hedyosum genus which includes 65 tropical species. The latter 2 stages consisted of plant compositions that don’t occur in present day cloud forests. The authors of this study also measured the amount of sporormiella in the sediment. Sporormiella is a dung fungus and is used as a proxy for megafauna abundance when fossil evidence is not available. The amount of sporormiella suggests megafauna were present but not abundant. Ground sloths, giant armadillos, and gompotheres (a type of mastodon) compose part of the regional fossil record here. These species were likely the source of the sporormiella in the 42,000 year old sediment. Fire is rare in montane cloud forests, but there are plenty of other agents of change that cause the environment to go through successional stages. Landslides on steep slopes after heavy rains can demolish a forest, opening an opportunity for pioneer plants. Wind throws and forest dieback from old age, disease, or insect infestation also opens up space for pioneer species. Megafauna probably had just a minor impact on Pleistocene cloud forests because they were not abundant here and plant growth is rapid. The authors of this study did find volcanic ash in the sediment. Volcanic-sparked fires do burn some cloud forests, forcing the environment to regenerate through several successive stages. Oaks are such an important part of the temperate forest ecosystem that it’s hard to imagine they originally evolved near the arctic circle. During the Eocene about 45 million years ago the earth was mostly tropical and sea levels were much higher than they are today. There were no ice caps, and climate at the poles was warm and temperate. Nevertheless, for almost half the year the sun didn’t rise near the arctic circle, just as today night is nearly 6 months long in places like Alaska. Seasonal darkness led to the evolution of deciduous trees that saved energy by dropping their leaves during winter when the sun didn’t rise. This adaptation became a great advantage when worldwide climate cooled. Deciduous trees pushed south because they were able to survive dormant cool seasons that began to occur during the start of the Oligocene ~33 million years ago. Deciduous trees, especially oaks, replaced tropical species incapable of coping with winter frosts. Deciduous trees didn’t waste energy with unnecessary growth during winter. Evidence of the ancient forests where oaks originated exists near the arctic circle at a site known as Axel Heiberg Forest. Today, this site is a polar desert, but wind erosion is gradually uncovering the forests that existed here 46 million years ago. A series of floods, perhaps 1 every 10,000 years, covered these forests in sediment, so there are layers of tree stumps, roots, and fallen logs continuously being revealed, as winds strip the sediment away. Sediment covered the forests rapidly during these catastrophic floods. It is not a petrified forest because the geological conditions did not favor fossilization. So once exposed to air, the ancient wood begins to decay, though the process is slow in cold arid conditions. Scientists think the environment was a warm seasonal rain forest. 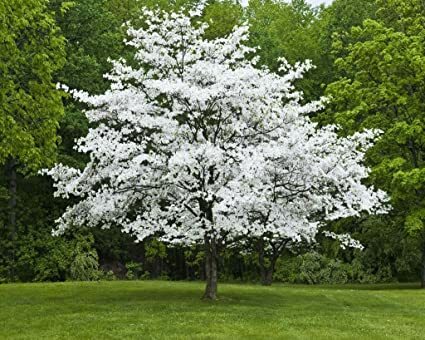 Tree composition consisted of dawn redwood, Chinese cypress, hemlock, pine, spruce, larch, gingko, and extinct species of birch, alder, sycamore, walnut, hickory, and oak. Location of Axel Heiberg forest–site of the oldest subfossil remains of oaks. Today, it is a polar desert, but during the Eocene it was a temperate seasonal rain forest. Subfossil wood from Axel Heiberg forest. Comparison between white oak leaves (top) and red oak leaves (bottom). White oaks and red oaks ecologically complement each other and colonized North America at the same time. 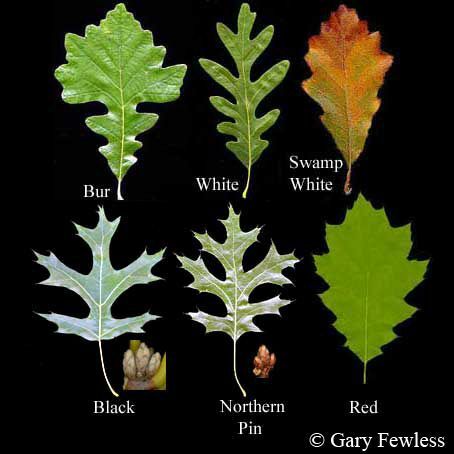 Oaks are classified into 2 groups–red oaks and white oaks. Genetic evidence suggests red oaks diverged from white oaks about 33 million years ago when they both began to colonize latitudes south of the arctic circle. Red oaks produce crops of bitter acorns every other year, while white oaks produce more palatable acorns annually. The strategic difference in acorn production is an ancient ecological balance, attracting squirrels and other seed distributors equally. Genetic evidence also shows eastern red and white oaks are sister species to western red and white oaks. Mexican oaks are sister species to eastern oaks, having diverged between 10-20 million years ago. Oaks colonized eastern and western North America at the same time, then later eastern oaks invaded Mexico. Mexico has more species of oaks than any other region in the world (154 species). If a region has more species of a genus, it usually is thought to be the region where that genus originated. Instead, scientists believe Mexico has a greater number of oaks species because of differences in elevation in mountains closer to the equator. Mexican mountains host many different ecological niches causing frequent speciation among oaks. This explains why Mexico is home to more species of oaks than any other region in the world, though it is not where they originated. A new study reinforces evidence, indicating some regions of southeastern North America were harsh environments during climatic phases when the ice sheets that covered Canada were expanding. The scientists who wrote this paper took cores of sediment from 2 Carolina Bays (Jones and Singletary Lakes) located in Bladen County, North Carolina. Carolina Bays are elliptical depressions found on the Atlantic Coastal Plain that were formed during Ice Ages. They were created by a combination of peat fires, and wind and water erosion. The peat fires lowered the elevation, wind blew out the dried unconsolidated sediment, and wind-driven water shaped them into elliptical formations. Jones and Singletary Lakes were also studied in the early 1950s in 1 of the first paleoecological studies of late Pleistocene environments of the south. The new study analyzed pollen composition, charcoal abundance, and biomass; and the authors compared their results to the earlier study. The data was dated using radio-carbon dating. Location of Bladen County, North Carolina. This is the site of the study areas discussed in this blog entry. Photo of Singletary Lake, a Carolina Bay. Scientists took a sediment core at the bottom of this lake and analyzed pollen, charcoal, and biomass abundance over the past 50,000 years. Between ~60,000 years BP-~30,000 years BP climate fluctuated drastically between warm wet interstadials and cold arid stadials. The glaciers covering Canada advanced then retreated then advanced again in fits and starts. During glacial expansion more of earth’s atmospheric moisture became locked in glacial ice, causing prolonged droughts, but this moisture was released when glaciers were in a meltwater phase. Oak and grass pollen increased during meltwater phases, and so did charcoal abundance. An increase in vegetation meant there was more biomass to ignite and burn during electrical storms. Oak and grass were fairly abundant from ~43,000 years BP-~32,000 years BP. The environment mostly consisted of woodland and grassland during interstadials, but about 30,000 years BP the situation deteriorated. Ice sheets maintained a steady expansion from ~30,000 years BP-~21,000 years BP. The initial drought that struck the region during this phase killed vegetation and caused a temporary spike of charcoal because the dead biomass was so flammable. But after this initial spike, fire was rare to non-existent here. Sand dunes rolled across the landscape because much of the region was sparsely vegetated. I believe scrub oak thickets with thorny plants adapted to arid climates covered much of the landscape, but this type of environment doesn’t produce much pollen. 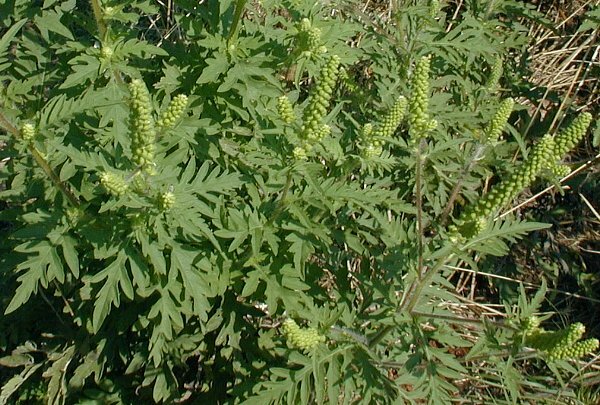 Thus, the amount of vegetation on the landscape then is understated in the pollen record. For this reason I don’t believe the landscape was as bare as the authors of this study concluded when they wrote it was a “windswept sandy desert with riparian communities of pine and oak.” Nevertheless, it was an harsh environment of thorny thickets interspersed with areas of bare soil and long distances between water and wetland environments where some trees and grass still grew. Some tough species of mammals that could survive in this type of environment included horse, flat-headed peccary, helmeted musk-ox, and hog-nosed skunk. Bison evolved into a smaller species more capable of living in a drier natural community. 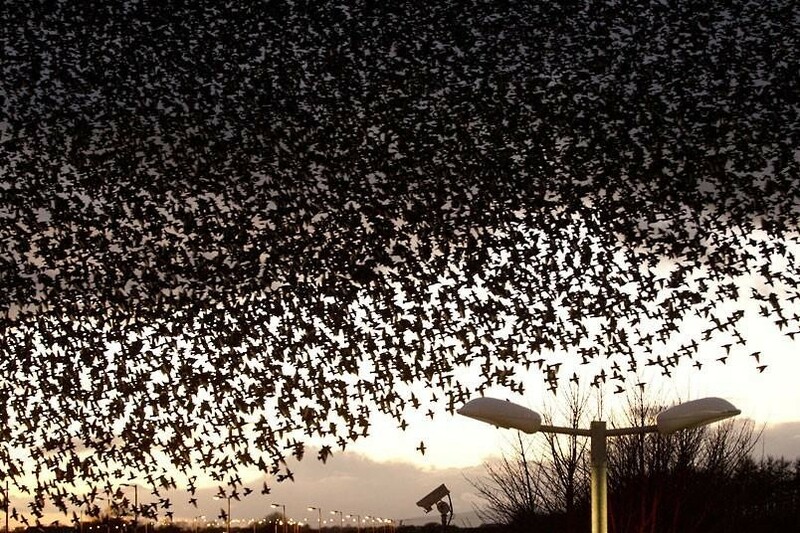 Overall, wildlife populations probably declined during this climatic phase. About 21,000 years ago, the ice sheets began retreating and precipitation increased. Oak and grass gradually increased in abundance, and eventually mesic species such as cypress, basswood, hemlock, and beech invaded the resulting wetter habitats. ~12,000 years ago, man colonized the region and overhunted megafauna into extinction. Human-set fires combined with an increase in biomass not being consumed by megaherbivores caused a great increase in fire frequency. I’m skeptical of 1 claim made by this paper. The authors estimated the average annual temperature and precipitation levels based on plant composition assumed from the pollen record. During the Last Glacial Maximum they estimated the average January temperature at these sites was 20 degrees F, while the average July temperature was 68 degrees F. However, they use 2 dubious assumptions. They believe the pollen grains from northern species of pine can be distinguished from those of shortleaf pine, a southern species. This is a doubtful assumption that I will examine more thoroughly in my next blog entry. Moreover, the spruce pollen probably originated from an extinct species of temperate tree known as Critchfield’s spruce. I don’t think they can estimate average annual temperatures based on pollen composition, unless the exact species are known with more certainty. The outer coastal plain and the continental shelf, which was above sea level from ~80,000 years BP-~7,000 years BP, likely hosted richer environments than the inner coastal plain during stadials. Sea breezes and weather fronts spawned in the Atlantic Ocean brought more moisture to the coast, allowing this region to maintain a mosaic of woodland, grassland, and wetland; while the inner coastal plain suffered greater aridity. These fronts usually dissipated before they reached the inner coastal plain. The coastal region likely served as a refuge for plants and animals that later re-colonized the inner coastal plain when climatic conditions improved. You are currently browsing the archives for the Ecology category.